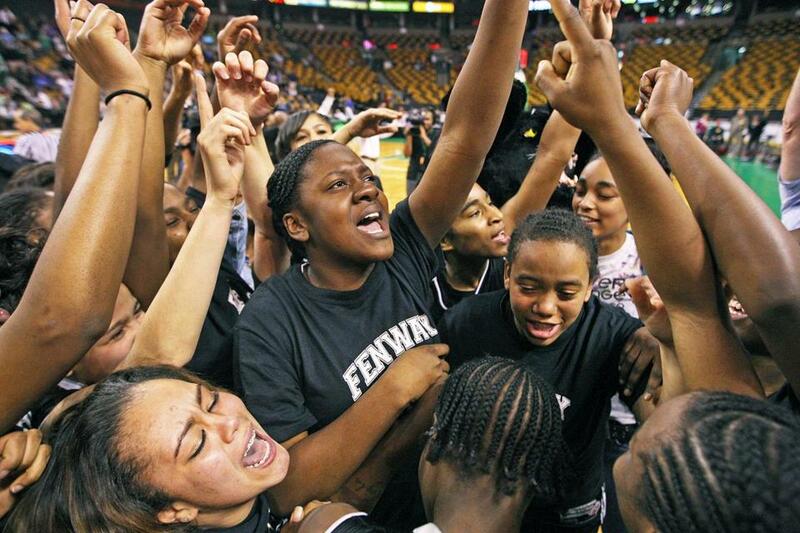 The Fenway girls basketball team had a lot to cheer about this winter, including the school’s first city title and a state championship. If you’re a fan of high school sports, the winter never seems long enough. The season may have lacked snow this year, but it didn’t lack for excitement. Fans in places like Newton, Andover, Wayland, and Danvers enjoyed every minute. That’s because those communities celebrated state championships and there’s nothing like a trophy to make staying indoors worthwhile. Whether it was a senior capping off a great career (Nicole Boudreau at Andover) or a freshman debuting with a state title (Ryan Girouard at Burlington), success found many homes. From Nauset to West Newbury, it was a season of great accomplishments. Following are 10 highlights that stood out from among the countless athletic stories in Massachusetts. They dive too? That was the immediate reaction after seeing the names O’Brien and Concord-Carlisle listed as MIAA boys’ and girls’ state dive champions. But before you think our fall All-Scholastic and All-American cover kids of Michael and Andrea O’Brien traded in their soccer shoes for swim suits, rest easy. Sean and Meghan O’Brien are your divers, and they’re not related to Michael and Andrea. But talk about coincidences. Sean broke his own state record this winter and is headed to the University of Texas to continue his career. His sister Meghan is a freshman. And just wondering ... are there any O’Briens on the baseball and softball teams at C-C? Fenway isn’t new. The Division 4 school in the shadow of the Red Sox home field was founded in 1983. But what started Feb. 24 at the city championships was new, as the Panthers beat O’Bryant for their first city title, the first crown in an amazing run to a state championship. ‘‘I just tell the kids to have fun,’’ said coach John Rice. ‘‘You have to enjoy the competition ... I’m so proud of these kids.’’ The team was led by seniors Tajanay Veiga-Lee and Kayla Cox. ‘‘It’s my last year so I just wanted to give my team the best effort possible,’’ said Cox after the win over Greater New Bedford. She did, and Fenway hit a home run. There was no way the members of the Wellesley nordic ski team were going to miss the wake of their friend and team member Hannah Randolph, 15, who died in a tragic skiing accident during a February family vacation. But the Wellesley boys were scheduled to compete in the afternoon, and with the state championship in Vermont, they wouldn’t be back in time. But the coaches had an idea. Why not let the Wellesley boys race as the final group in the girls’ title race, cutting an hour off their race day. MIAA officials agreed. After a moment of silence to honor their teammate, Wellesley raced, finishing 13th. But more importantly, they made it home in time. This winter Orthodox Jewish high schools in Texas and Massachusetts qualified for their state basketball tournaments. Both were scheduled to play on a Friday night. But when officials in each state were reminded of the Sabbath observation, the stories took very different turns. In Texas, parents at Robert M. Beren Academy were forced to sue the state association after it refused to move the game. The case made headlines across the country. But in this state, when Maimonides asked MIAA tournament officials to push the girls’ game back a day, it was moved without hesitation. And the resulting four-overtime affair, won by Lowell Catholic, was worth the wait. What were you thinking? Isn’t that what you wanted to ask the Winthrop hockey parent who thought shooting a laser at the opposing team’s goalie was a good move? What were you thinking? If you were at that Feb. 29 girls’ tournament game between Medway/Ashland and Winthrop, you might have noticed the green beam of light bouncing off the Medway/Ashland players. Officials certainly did and threw the man, later identified as Joseph Cordes, out of the rink. He was charged with disturbing the peace. ‘‘No one’s heard of this one,’’ said MIAA spokesman Paul Wetzel. ‘‘It’s bizarre.’’ That’s putting it mildly. Malden Catholic‘s Brendan Collier hugs former coach Chris Serino after the state title game. She finished her career as one of the greatest basketball players in state history. And when Andover won its third straight state title, Nicole Boudreau led the way with 31 points, giving her a career total of 2,200. ‘‘Nicole is just an incredible, incredible player,’’ said coach Jim Tildsley. ‘‘The things she does out there that people don’t see, she just knows the game.’’ A humbled Boudreau seemed overwhelmed by the moment after the Golden Warriors beat Holyoke at the DCU Center. ‘‘I’m honored to have worn an Andover uniform and hopefully represented it pretty well.’’ What do you think? I’d say she has. Paul Sughrue (left) and Christian Monserrat both won state wrestling titles for Methuen. Methuen coach Bill James was running out of words to describe the success enjoyed by his wrestling team this winter. ‘‘It’s been an unbelievable season. To walk out of here with the three state champions is great,’’ said James after Christian Monserrat, Paul Sughrue, and C.J. Doherty won at the All-State meet. ‘‘It’s just been an incredible year.’’ A week earlier Methuen had won the Division 1 team title, riding eight seniors to the Rangers’ first state championship since 1997. With Monserrat and Sughrue back next year, expect Methuen to be back as well. ‘‘If they put the time and effort into it, we can be really good,’’ said James. Good? How about fantastical? With the Super 8 tournament underway, Hingham senior captain James Gordon knew something wasn’t right. He hadn’t been feeling well for weeks but rather than seeing a doctor and risk being told his season was over, Gordon fought through the discomfort and played in all three Harbormen games. Then he went to his doctor. The diagnosis was cancer. Surgery was performed, and he’s already begun chemotherapy. Gordon, a member of the 2010 Super 8 winning team, had 40 points this season, was the team MVP, and is called ‘‘a quiet leader with an unbelievable work ethic’’ by his coach Tony Messina. The medical odds say Gordon will win. His friends and teammates knew that already. It was a crazy postseason for the MIAA girls’ swimming community. The news that Don Lemieux was removed as Gardner’s coach not only meant the man behind the Wildcats’ 16 state titles was gone, but when most of his team boycotted the Division 1 meet in a show of support, so too were many of the state’s top swimmers. But the show went on and Westford won the Division 1 title behind sophomore Jen Marrkand. And in Division 2, Wayland didn’t win a single event, but had the depth to win the state title. ‘‘It was a total team effort,’’ said coach Mike Foley. A cliche? But in this case, it was the truth.